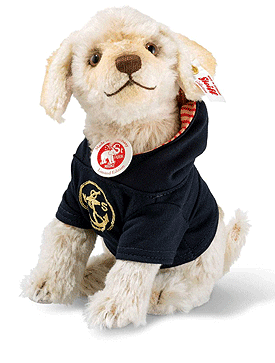 Nautical Nicky Dog by Steiff. A beautiful limited edition Steiff item, hand made in cream mohair. This very special piece, displays the white ear tag, which identifies the item as a Steiff limited edition, together with the famous gold plated Button in Ear. Limited edition of only 1500 pieces worldwide. Full steam ahead: Nautical Nicky is a proud mascot for 1,500 passionate motorboat and ship captains around the world. Decked out in finest mohair and a marine sweater – embroidered with an anchor surrounded by an M and S – he is well equipped for chilly weather. With his jointed head, he sits safe and secure and watches the sea. Which salty old sailor would love the company of this four-legged friend?